This is where the rubber meets the road. After the Strategy Planning Sessions, we can focus on executing the road map to strengthen the people, processes, and technologies that will facilitate meeting your business objectives. Question: How can vendors, services, and costs effectively be managed if your CIO is one of your vendors resources? We are your Chief Information Officer (CIO). Not a vendor working to get more of your business. We work for you! Brinex does not maintain contracts with other vendors (Infrastructure, Software, Consulting, etc.) that pay us kickbacks. Those values go against our model. We act in your best interest, not the interest of the vendors. 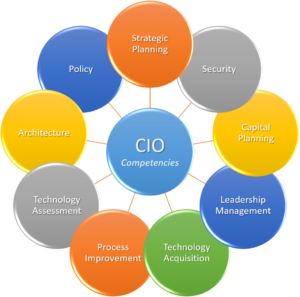 A CIO will employ all 9 of the CIO Competencies to your company's benefit. These are required for overall Information Technology direction, governance, and planning to support strategic business initiatives. Meeting with management and staff on a weekly basis, a CIO brings deep Information Technology experience to bear, demystifying complex technology, adding clarity to projects and processes, and helping management make prudent decisions. Why can't our IT manager do this? The IT manager controls the rudder on the boat to keep it going in a set direction. That's fine until that manager has to navigate around something he or she can't see yet. What's needed is someone with a map, astrolabe and charts, and the knowledge to guide the boat to its destination while avoiding hazards. And, not unlike running your boat aground, hazards in an IT organization can spell disaster. Couldn't we just hire a project manager to do this? This sounds like the answer, but it is only part of the equation. While it is true a project manager keeps track of projects and manages resource allocations during the course of a given project, a project manager does not address the overall alignment of IT-to-business strategy nor does the project manager set policy, select architecture, enforce enterprise-wide security standards or directly address the other competencies of a CIO. Conversely, the CIO is not a project manager. The CIO manages the overall portfolio of projects for the organization to ensure they remain in alignment with business strategy. Does your budget constrained organization need a full-time CIO? Many mid-market, or smaller, companies don’t require a full-time Chief Information Officer (CIO) to fill the gap between executive management and Information Technology. This is where a Virtual CIO (vCIO), CIO for Hire, or an Interim CIO becomes a cost effective decision. Brinex will deploy a Senior Strategic Technology Advisory to be available to your executive team. The most cost-effective solution we have found is to use the services of a Virtual CIO when organizations are budget constrained for a full-time CIO. Your organization still receives the value add of a professional who can bring the competencies areas at a reduced cost on an as needed basis. A Virtual CIO can provide the level of service, knowledge, and leadership your organization requires to meet objectives and during strategic planning sessions. Our experienced professionals can also serve in a Interim CIO capacity during a transition period. Additionally, with our network of CIO's, we can provide the best in class talent that meets your industry and organizational standards for a CIO-For-Hire. Schedule a free consultation to begin conversations during your yearly budget and strategic planning sessions. We can review your department, processes, team, and budget to provide a "Opportunities for What's Next" assessment packet. This is a critical step in assuring your business objectives and your IT strategy is aligned. Our goals are to work to align IT initiatives to your business strategy, reduce cost, provide vendor management services, overall project/portfolio management, and thereby effectively raising your organizations capabilities and profitability. Get the latest on Brinex and Information Technology news for your business. What is the value of an IT Strategy?